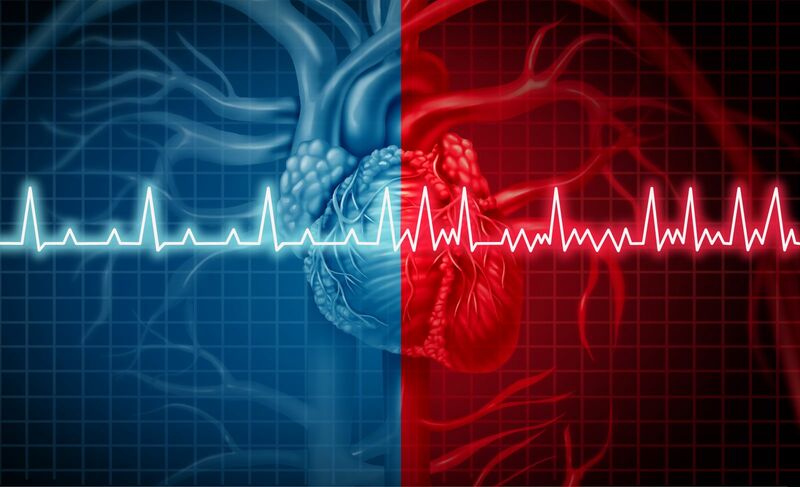 Is atrial fibrillation serious? People who are old enough to remember the sound of wind-up clocks often refer to their hearts as their "tickers." It's an affectionate term that pays tribute to the regular, rhythmic beat of the healthy heart. In fact, though, the healthy heart is much more sophisticated than the most precise Swiss timepiece. Instead of maintaining a single, monotonous beat, the heart can speed up in response to exercise, strong emotions, and fever. Common chemicals can also jack up the heart rate; examples include caffeine, nicotine, and decongestants. And the healthy heart can also slow down when you rest, relax, or sleep. A clock keeps a steady rate of 60 beats per minute, while your heart rate may vary between 50 and 100 beats at rest and rev up to twice as fast during exercise. But sometimes the mechanisms that regulate the rate and rhythm go awry. Doctors call these disorders arrhythmias; they come in many varieties, but the most common sustained arrhythmia of all is atrial fibrillation (AF). AF is a new concept for many men, but it's plagued men's hearts for millennia. In fact, the first written description dates back to China some 4,000 years ago. An English physician named William Withering discovered the first useful treatment for AF in 1785 when he gave the leaf of the foxglove plant (Digitalis purpurea) to a patient whose pulse became "more full and regular." Digitalis derivatives are still in use today, but modern understanding of AF was delayed until the invention of the electrocardiograph in the early 1900s. And more than a century later, the treatment of AF continues to evolve and improve, providing important benefits to many people, but introducing many complexities for both doctors and patients. The human heart is divided into four pumping chambers (see figure). The two upper chambers are called the atria; they collect blood from the veins, then pump it into the two ventricles, larger and stronger chambers that propel the blood out from the heart to the rest of the body. To function best, the atria should contract first, with the ventricles close behind. The electrical messages that signal the heart muscle to contract begin in the atria (at the SA node), and then travel across the AV node into the ventricles to trigger the contractions you feel as your pulse. The entire sequence can be recorded on an electrocardiogram (ECG), where the atrial contractions appear as P waves and the ventricular contractions that follow show up as QRS complexes (see figure). When the heart is in its normal rhythm, the atria contract at steady, regular intervals. But in AF, the atria's electrical signals occur much more rapidly, often 350 to 500 times per minute. At these rates, the muscle just can't contract in a coordinated fashion. Instead of producing an atrial beat, the muscles just quiver (fibrillate) ineffectively. The ventricles are bombarded by fast, irregularly spaced atrial impulses, but they are partially protected from breakneck speed by the AV node, which intercepts the atrial impulses and blocks many of them before conducting some to the ventricles. Still, the ventricular rate is usually much faster than normal, and the rhythm is irregular, as is your pulse. 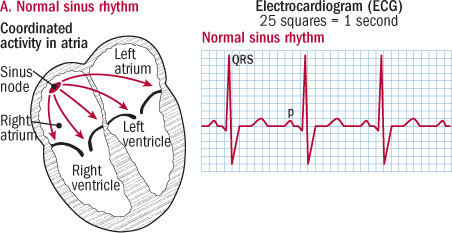 In normal sinus rhythm, the sinus node initiates the electrical activity that triggers each heartbeat. The electrical impulse travels through the atria, signaling the muscle to contract; each atrial contraction shows on the ECG as a p wave. The electrical activity then crosses into the ventricles, stimulating them to contract and pump blood to the body's tissues (shown in ECG as the QRS complex). In atrial fibrillation, the atria's electrical signals are very rapid and erratic; the atria don't contract and there is no p wave. Without a coordinated signal to guide them, the ventricles contract at a rapid rate in an irregular rhythm. Scientists don't fully understand the basic problems behind AF, but they do know many of the factors that increase the risk of AF. Age is an important factor; AF is uncommon before age 50, but it affects nearly 8% of men between 65 and 74 and almost 12% between 75 and 84. Gender is also important; AF occurs about 50% more frequently in men than women. Since about a third of all patients with AF have a family history of the disorder, heredity also plays a role, and several specific genetic abnormalities have already been identified. Cardiovascular conditions are strongly linked to AF. The three most important are high blood pressure, heart valve disorders (particularly mitral valve problems), and coronary artery disease (with or without a heart attack). Heart failure, a debilitating problem that occurs when the weakened heart muscle is unable to pump blood effectively, is another risk factor for AF. Less often, inflammation in the membrane around the heart (pericarditis) triggers AF. Lung disorders also increase the risk of AF. Culprits include chronic obstructive lung disease, blood clots in the lungs (pulmonary emboli), and pneumonia. Chest surgery is another cause. A wide variety of medical conditions are associated with AF. An overactive thyroid gland (hyperthyroidism), diabetes and obesity increase risk, as do medications such as bronchodilators used for asthma and COPD. Behavioral factors are also tied to AF. Always a villain, smoking is on the hit list. Moderate drinking does not lead to AF, but excessive alcohol consumption does, particularly in the setting of binge drinking. Anger and hostility boost the risk of AF in men. Surprisingly, perhaps, caffeine does not appear to be a risk factor. Although vigorous exercise sometimes triggers AF in young men, walking and other moderate physical activities provide long-term protection. Some studies suggest that taking statin drugs or eating fish may reduce the risk of AF over the long run, while others do not. Beta blockers, ACE inhibitors, and angiotensin-receptor blockers (ARBs) appear to reduce the risk of AF in patients with hypertension. There are several ways to categorize AF. In one system, it's called primary AF when the problem originates in the heart itself, and secondary AF when it results from a noncardiac medical condition, in which case the AF often resolves when the underlying problem is corrected. When primary AF occurs in a structurally normal heart, it is called lone AF, which carries a relatively low risk of complications. Other types of primary AF, however, can be more troublesome. paroxysmal AF — recurrent episodes of AF that end within seven days without treatment. Most bouts of paroxysmal AF end in less than 24 hours, but even though episodes are brief, patients are still at risk of stroke. persistent AF — episodes that last longer than seven days or require treatment to convert back to a normal heart rhythm. The longer an episode lasts, the harder it is to restore a normal rhythm. permanent AF — AF that has lasted longer than a year. The symptoms of AF vary widely. They tend to be more severe in older people and in those who also have structural heart or lung disease. Men who are in good general health may not even be aware of the arrhythmia. Others notice a fluttering sensation in the chest or a rapid and/or irregular heartbeat. Fatigue, increased nighttime urination, shortness of breath, and exercise intolerance are common and can be severe in patients who had weakened hearts or diseased lungs even before AF hit. Lightheadedness, confusion, and sometimes even fainting may signal a substantial fall in blood pressure due to AF. Patients with coronary artery disease may suffer angina or a heart attack when they develop AF. Because AF reduces the heart's pumping capacity, fluid can build up in the legs or lungs, particularly if the patient had some degree of heart failure even before the onset of AF. Doctors suspect AF when they hear an irregular heartbeat or feel an irregular pulse; a standard electrocardiogram, or ECG (see figure), will confirm the diagnosis if the patient is tested during an episode of AF. But if the AF is paroxysmal, or intermittent, a doctor may ask his patient to wear a Holter monitor or event monitor at home; these are small devices that record ECG tracings continuously (Holter) or intermittently (event) to document brief or episodic arrhythmias. Diagnosing AF is relatively easy, but testing doesn't stop there. In most cases, doctors will order an echocardiogram or cardiac ultrasound to evaluate the heart's valves and muscular contractions; an advanced type of ultrasound, the transesophageal echocardiogram, may be used to evaluate stroke risk. Blood tests to measure thyroid, kidney, and liver function and red blood cell levels are important. Many patients benefit from additional lung or heart studies. Diagnosing AF may be relatively easy, but deciding how to treat it can be quite difficult. To understand your therapeutic options, you should first understand why AF needs treatment. Patients with AF are at risk for three major complications: heart failure, angina, and stroke. AF reduces the heart's pumping capacity. Although the atria are small chambers with relatively weak muscles, they still contribute a "kick" or boost to the larger, more powerful ventricles. In addition, the rapid heart rate of AF reduces the efficiency of each beat. In all, AF reduces the heart's pumping capacity by 10% to 30%. People whose hearts are otherwise healthy can compensate for this impairment, but those with damaged heart muscles or valves cannot. As a result, they experience the fatigue, breathlessness, exercise intolerance, and swelling of the feet and legs that are so characteristic of heart failure. AF can also trigger the chest pain of angina or a heart attack in patients with coronary artery disease. The other major complication of AF is stroke. Although doctors have studied AF for over 100 years, the risk of stroke was not fully appreciated until the 1980s, when the Framingham Heart Study reported that 24% of its stroke patients were also in AF, and that the abnormal heart rhythm developed within the six months preceding the stroke in about a third of these participants. AF quintuples the risk of stroke. It accounts for about 15% of all strokes and for nearly a quarter of all strokes in people ages 80 to 89. How does a cardiac abnormality cause brain damage? Since fibrillating atria don't contract, they contain relatively stagnant pools of blood. Clots (thrombi) form in these areas, then break off and travel to the brain, where they block small arteries, depriving the brain of its vital oxygen and causing tissue damage and death. It's a devastating sequence of events, but it can be prevented by anticoagulants, medications that fight blood clots. In fact, the use of anticoagulants is one of the key priorities in the management of patients with AF. The others are slowing the heart rate and, in some patients, restoring a normal heart rhythm. Since the dangerous complications of AF result from its abnormal rhythm, logic dictates that restoring a normal rhythm would be the highest priority of therapy. Cardiologists understand that logic, but they also know that clinical trials are necessary to find out if theory translates into reality. Between 2000 and 2008, six independent, high-quality clinical trials randomly assigned patients with AF to one of two treatment groups. In one group, the goal of therapy was to control the heart rate while tolerating the irregular rhythm; in the other, the goal was to restore and maintain a normal rhythm when possible. A similar, very high percentage of patients in both groups received the recommended anticoagulant therapy to prevent strokes. A total of 6,615 patients volunteered for the six trials. Despite differences in the patient groups and the methods used to achieve rate or rhythm control, all the trials arrived at the same conclusion: rhythm control does not produce better results than rate control in terms of survival, cardiac complications, or relief of symptoms. In fact, the rhythm control strategy was associated with a higher rate of hospitalizations and greater expense. Why did rhythm control morph from no-brainer to no benefit? Restoring and maintaining normal rhythm is no small feat. It typically involves medications and may require additional procedures ranging from an electric shock to heart surgery. Slowing a racing heart requires medications, too, but they are safer and produce fewer side effects than the specialized drugs used for rhythm control. And since most AF patients require anticlotting medication even after normal rhythm is restored, the rhythm control strategy does not even have the advantage of reducing the burden of anticoagulation. These important randomized clinical trials suggest that rate control may be the first choice for many, even most, patients with AF. Still, some may benefit from rhythm control. Likely candidates include individuals who are diagnosed promptly after the onset of AF, patients with a first episode of AF, patients with AF triggered by a medical problem that has been corrected, younger people, and those who continue to have troublesome symptoms despite rate control. And if these considerations are not complex enough, there are several ways to slow rapid AF and many, many options for rhythm control. Here's a brief rundown. Medication can slow down the racing heartbeat in nearly all patients with AF. The most useful drugs are beta blockers (such as propranolol and metoprolol) and calcium-channel blockers (such as diltiazem and verapamil); even so, digoxin (the modern version of the foxglove plant first used for AF over 225 years ago) still has a role in select patients. Patients who have chest pain or shortness of breath can receive rate-controlling medications intravenously; most respond in minutes to hours. Oral medications take longer to kick in, but most patients with sustained AF require long-term oral medications to maintain heart rate control. Although precise heart rate targets have not been established, many doctors adjust medications to achieve a heart rate of about 60 to 80 beats per minute when the patient is at rest and about 90 to 115 during moderate exercise. However, a study found that lenient heart rate control with a target resting rate of up to 110 beats per minute is just as beneficial as stricter target heart rates. The fastest and most effective way to convert AF back to a normal heart rhythm is to jolt the heart with an electric shock. Electrical cardioversion sounds shocking, even drastic, but since it uses only a small, brief pulse of DC current, it is really quite safe — and since patients are sedated, it's only mildly uncomfortable. Electrical cardioversion is most likely to succeed when used soon after the onset of AF. To prevent stroke, nearly all patients who have been in AF for more than 48 hours should have three to four weeks of anticoagulation (see below) prior to cardioversion, and nearly all benefit from at least four weeks of anticoagulation after the procedure. Anticoagulation should be continued indefinitely in patients at moderate to high risk of stroke, even if they maintain a normal rhythm. Drugs can also be used to convert patients from AF to a normal rhythm, and long-term medication may be needed to preserve a normal rhythm after successful electrical or pharmacological cardioversion; long-term anticoagulation is also generally necessary. The choice of medication is tricky, and anti-arrhythmic medications can have severe side effects, even including serious arrhythmias. As a result, while primary care physicians often manage rate control, rhythm control is best guided by cardiologists. Amiodarone is frequently the drug of choice. Other specialized drugs that may be useful include sotalol, flecainide, and propafenone. Some carefully selected patients with recurrent bouts of AF can take a single dose of flecainide or propafenone on their own (the "pill-in-the-pocket" approach) to convert AF as soon as they notice the irregular heartbeat of AF. Today cardiologists often recommend restoring a regular heart beat with radiofrequency ablation. The idea is to destroy a tiny amount of tissue in or near the heart to stop it from sending out the abnormal electrical signals that trigger AF. First, patients undergo sophisticated testing to detect and map the offending tissue. Next, doctors thread a tiny catheter, or tube, through a blood vessel in the groin up into the heart. When the tip of the catheter is up against the offending tissue, which is usually in or near the pulmonary veins, a radiofrequency electrical current is passed through the catheter to destroy, or ablate, the target. Most patients with AF feel fine once their heart rate is controlled. But their well-being is deceptive, since they are still at risk for stroke. The risk is particularly high in older patients, in patients with hypertension, and especially in patients with previous strokes or heart valve disease, particularly an artificial valve or narrowing of the mitral valve (mitral stenosis). Fortunately, anticoagulants ("blood thinners") can help protect AF patients from stroke. Aspirin is the simplest, safest, and least expensive, but it is also the least effective, reducing the risk of stroke by about 20%. Warfarin (Coumadin) reduces the risk of stroke by about 60%. It has been the mainstay of therapy for decades, but it requires careful attention to medications and dietary factors that affect therapy as well as frequent adjustments in dose, based on the results of blood tests performed every two or three weeks. Direct oral anticoagulants (DOACs). Apixaban (Eliquis), dabigatran (Pradaxa), edoxaban (Savaysa) and rivaroxaban (Xarelto) are as effective as warfarin for people with atrial fibrillation not due to a heart valve problem. They do not require the dietary restrictions and frequent blood tests that make warfarin therapy tricky and inconvenient. On the downside, they are much more expensive. Researchers continue to study new ways to improve the management of AF. But for now, the tried and true will serve most patients well: slow the racing heart, consider restoring normal rhythm if symptoms persist, and reduce the risk of stroke by preventing clots. Atrial fibrillation is an old problem, but it can be treated effectively, whether by standard therapy or newer innovations.